Industrial Diagnostics for Industry 4.0 In most facilities, real-time condition monitoring and protection of critical rotating equipment, is standard practice. However, monitoring of second-tier equipment has traditionally been deemed cost-prohibitive or too difficult. While these unmonitored assets may not have been originally classified as critical, a sudden failure of this equipment can still cause serious process disturbances, shutdowns, slowdowns or further damage to equipment. 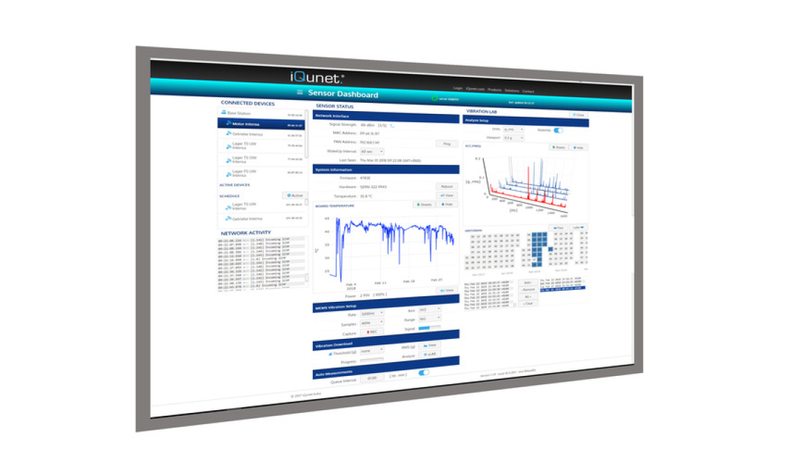 iQunet battery operated wireless technology makes it possible to justify on-line monitoring of essential assets as part of an overall site reliability initiative. Wireless Battery Operated Sensors iQunet introduces a major breakthrough in wireless, battery-operated sensors and network technology to manage assets in industry and buildings. iQunets easy-fit sensors measure physical machine parameters such as bearing vibration, temperature, proximity, rotation, humidity, inclination, and others. iQunet intelligent sensors have a microcontroller onboard and run innovative and outstanding stable embedded firmware. The iQunet optimized wireless protocol is based on the most recent standards to reduce communication overheads to a minimum, while maximizing data payload. Thanks to the iQunet sleep mode current consumption is extremely low (<1µA) resulting in an outstanding battery life time of many years. Robust and secure wireless system A small DIN-rail mounted Unix server continuously analyzes and optimizes the network to create the most efficient paths and to balance the load across available paths. The Base Station is the central node of the wireless network and can easily be attached to the wall or cabinet with the accompanying clips. It is powered by a standard micro-USB connection from the small iQunet DIN-rail Unix server. It can serve an unlimited number of sensor nodes within the wireless range due to the powerful iQunet network protocol.